The Southwestern Athletic Conference (SWAC) office revealed the 2018 All-SWAC Women's Tennis Teams with Jackson State’s No. 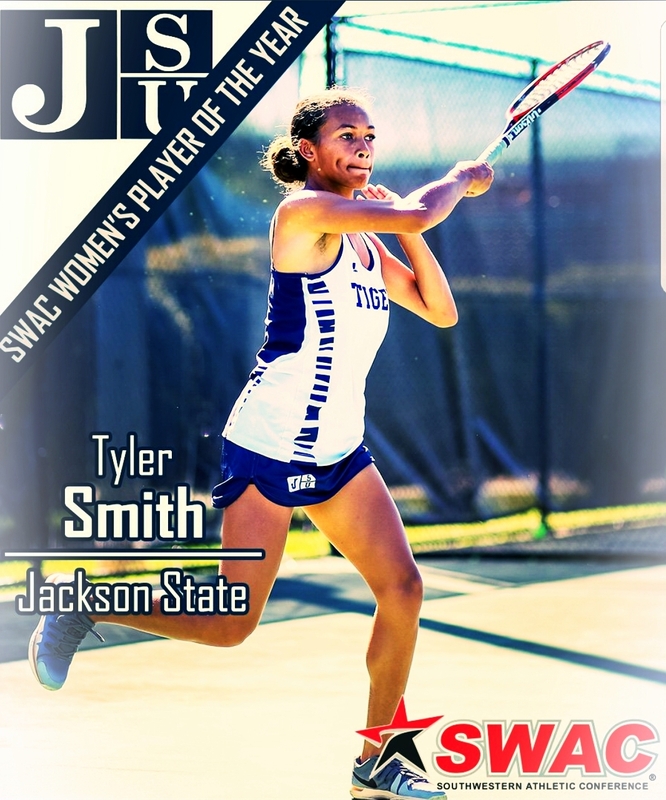 1 player Tyler Smith named back-to-back SWAC Women’s Tennis Player of the Year. Smith was also named to the All-Conference Singles 1st Team. Smith received the honor after finishing with the most wins of any player in the SWAC at 13-2. The senior reeled off 13 consecutive wins and did not take any defeats in Conference play as she went 6-0 in singles competition and picked up an additional victory in doubles play by teaming with Lucia Solis. Members of the All-Conference teams were decided upon by their conference records in Singles and Doubles competition. Ties were broken by considering a player’s position ranking with higher favorability granted to the higher seeded player. The top 12 players in the conference were chosen as part of the All-Conference Team. In addition, the large individual award winners were announced for Freshman of the Year and the Player of the Year. The women’s team comprised of players who went a combined 67-6 in conference singles play. There were seven players who joined the undefeated ranks in singles conference play with a minimum of at least four decisions including Smith (6-0) of Jackson State, Rufaro Chirewa (5-0) of Southern, Constanza Aranguiz (6-0) and Timara Maxwell (5-0) of Prairie View A&M, Marlene Maier (8-0) of Alcorn State and Reka Szentes (4-0) and Marija Blazevic (6-0), both of Alabama State.